Overview - Avanath Capital Management, LLC. Avanath is an investment firm that acquires, owns, renovates, and operates affordable, workforce, and value-oriented apartment communities across the U.S. Avanath partners with institutional investors – both domestically and internationally – to deliver quality primary housing in major metropolitan and suburban markets. A primary focus of our mission is to provide hard working families higher quality, well maintained, and safe value rental housing – a base for their pursuit of the American Dream. We invest not only in brick and mortar but in on-site services, amenities and activities that add value to properties and bring our residents’ desired lifestyles within reach.  Families with incomes of $30,000 to $80,000 represent the largest segment of the rental housing market. We regard the ability to serve this market as a social, cultural and financial opportunity. Many of these markets are underserved by institutional capital. Avanath can acquire apartment assets in these sectors and deliver risk-adjusted returns through current income and long-term capital appreciation. Daryl J. Carter and John R. Williams lead an Avanath Capital management team that averages 25 years of industry experience. Our professionals possess a strong track record in investing and operating value apartment communities – in both resident satisfaction and providing attractive returns to investors. Avanath is an SEC Registered Investment Advisor.